To Sum It Up: Just when Alexia may finally be getting a break from all of the attempts on her life, a ghost warns her of a threat against Queen Victoria. Naturally, Alexia must look into the matter, even if she finds her mobility quite limited at the moment. The course of the investigation turns up some rather surprising information, as well as the alarming realization that the would-be assassin may be an all too familiar figure. Review: I’m running out of words to laud the Parasol Protectorate series with—and I still have one book to go. So that review may consist of a sentence or two because I’ve spent everything in my vocabulary bank on Heartless. But we’ll worry about that at a later date. While the second and third books in the series, Changeless and Blameless, respectively, were both highly enjoyable reads, they were a notch off from the spectacular series opener, Soulless. 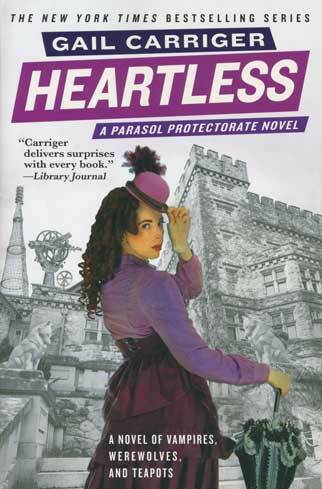 Heartless, I feel, is a return to what made the first book perfect—plenty of shared scenes between Lady and Lord Maccon. Alexia and Conall didn’t have all that much page time together in Changeless and especially in Blameless, and that was the missing element. Those two kids—I love them individually, but together, they’re phenomenal and just ignite the page. They squabble constantly, but that’s been the foundation of their relationship since Soulless. Without that tension, which produces so many hilarious quotes, they wouldn’t be Alexia and Conall. Even though the earl behaved like a certifiable dunderhead at the very end of Changless and throughout most of Blameless, my resolve to stay mad at him was weak. He makes me swoon too much. Everything about Lord and Lady Maccon’s relationship makes me swoon, even when the romance is teeming with sarcasm. In fact, I couldn’t envision it any other way. I was also happy to see Lord Akeldama (and his drones) put in plenty of appearances. The series would not be the same without his lordship’s italics. Professor Lyall and Floote are their usual reliable selves, trying to keep life from becoming too insane for Lord and Lady Maccon. Ivy gets a chance to prove herself as a secret agent of sorts when Alexia formally inducts her into the Parasol Protectorate and dispatches her on her first official mission (sensible hat choices apparently not being a requirement for membership in the organization). As intriguing an addition as Madame Lefoux has been to the series, I can’t help feeling extra fond of the original core group of characters. They all shine in Heartless, which was yet another reason why I loved this book so much. Quite a lot of craziness takes place toward the end of Heartless, setting up some extremely interesting story lines for the series finale. Alexia and her logic can always be counted on to solve the most difficult problems, though, so I have complete confidence that she’ll handle anything that heads her way, especially if that something is trouble. All in All: Nothing but love for this one! Oh so glad you loved this book! It does sound interesting, and I will definitely add it to my ever increasing TBR. Great review! It's an amazing series, and I recommend it to everyone! You should read more Steampunk, seriously!